HENRY H. ADNEY had nearly four years of experience as a Union soldier during his early life. His career has been a long and eventful one, and has figured in the history of Hamilton County since very early times. Hamilton County was not organized until 1886, but Mr. Adney had thrown his lot in with that frontier community as early as 1880. He is still one of the leading stock men and ranchers of Kendall township, his ranch being four miles west of the old town of Kendall. In that locality his home has been since he came to the county more than thirty-five years ago. Mr. Adney is a native of Ohio, born in Gallia County, January 11, 1841. He is descended from old English stock. His great-grandfather, Thomas Adney, was an Englishman who settled in Virginia in colonial times. One branch of the family since prominently identified with the state of Arkansas, had soldier representatives in the Revolutionary war. The grandfather, John Adney, married Barbara Lazena, a Frenchwoman, and they became the parents of eighteen children. Those who grew up were: Jonathan, Mrs. Rhoda Slaughter, Mrs. Anna Adney, Mrs. Polly Butler, Mrs. Sarah Hawkins, Mrs. Lovica Steele, William, who married a Miss Higley; Mrs. Rebecca Stevens, Mrs. Barbara Martin, and John L., who married a Miss Steele. Jonathan Adney, father of Henry H., was a "Tuckahoe" of Eastern Virginia, where he was born, but prior to the War of 1812 went with his father to Ohio, then a new and wild country. He grew up there, helped his father in clearing the farm, and always the rifles were close at hand for protection against the Indians. Miami County was their first home in Ohio, and later they moved to Gallia County, along the Ohio River, where Jonathan spent his active life as a farmer. He died in September, 1866. His wife, Electa Glenn, died in the winter of 1882. Her father, William Glenn, was a native of Virginia and of Scotch-Irish ancestry. Jonathan Adney was a man without training in school, having had only twelve days of school attendance while a boy in Virginia. Though little learned in books he became able to do all his own figuring, and as a practical farmer made a modest fortune. He served as captain of militia in early days, and in politics was a stanch whig and afterwards a republican. He was not a professing Christian, and laid stress upon his honesty and his word as the means of grace. His wife was a Presbyterian. Their family of children were: Jenette, who married Milton Kent and died in Ohio; Col. Glenn Adney, who died in North Carolina; Mrs. Maria Hamilton, who died in Ohio; Henry H.; Robert, an old soldier now connected with the government mint at San Francisco; Mrs. Ella Delay, of Emporia, Kansas; Calvin, who died in California; and Gerald, who died at Athens, Ohio, while in college. Henry H. Adney grew up in the county of his birth, had a common school education, and was just twenty years of age when the war broke out. In 1861 he entered Company B of the Thirty-Sixth Ohio Infantry. He enlisted at Vinton and went into camp at Marietta, where his company was mustered. His first captain was his brother, Glenn Adney, who later became a lieutenant colonel. The colonel of the gallant Thirty-Sixth Ohio was George Crook, later famous as General Crook, one of the greatest Indian fighters of the west. The regiment by order from the Governor of Ohio was sent into Western Virginia, and began rounding up bushwhackers. They were part of Cox's Kanawha Division and fought at Greenbrier, Louisburg, New River Bridge, and also in the second battle of Bull Run. Mr. Adney was in the fight at South Mountain, at Antietam, then back into West Virginia, and later with his comand was transferred by boat down the Ohio and up the Cumberland River in time to participate in the second battle of Fort Donelson. The Crook Brigade next marched across to the Stone River battleground and came into hostile conflict with Bragg's army at Hoover Gap and also in the little engagement at Tullahoma, Tennessee. While lying in the mud of that region they heard of the fall of Vicksburg, and such a yelling followed the announcement as threatened the peace and quiet of the very heavens. Crossing the river below Chattanooga and over Lookout Mountain, the command engaged in skirmishing until the battle of Chickamauga. Mr. Adney had a full two days of experience in that critical and decisive battle. He went through the stress and danger of the two days successfully, but his brother, then Major Adney, was wounded there. Mr. Adney is one of the few survivors who are competent to speak from personal recollection of the critical situation in which General Rosecrans' army stood at Chickamauga. The Confederates had it completely surrounded and only waited the moment to bag the game. The war council called by the commander-in-chief to consider the predicament was about to decide to capitulate. One of the officers in the council was the Russian General Turchin, commander of the brigade in which Mr. Adney was serving. When surrender was suggested, General Turchin replied: "I never surrenders, I cut my vay out." This speech was very pleasing to General Thomas, who up to that time had also been convinced that the case was hopeless. Thomas asked General Turchin if he would lead the charge, and the ready and gallant response of the foreign commander was one of those things upon which turned the destinies of a war. With his brigade leading; two Federal lines dashed against three lines of Confederates, steel against steel, and the Turchin Brigade, locking bayonets, went through, captured prisoners, and broke down the iron wall before it, reaching Rossville with Turchin the hero of the day. It is not idle to speculate upon what the consequences might have been but for this deed of the foreign general. One of the best armies Mr. Lincoln had would have fallen prisoners, the event would have encouraged the Confederates and intoxicated the entire South with its success of arms, and an even far reaching consequence might have been the acknowledgment by England of the independence of the Confederacy. It was a critical time in the fortunes of the Union arms, and the loss of that battle might have meant a divided instead of a united country, with all the northern states annexed to Canada by the British government. After Chickamauga Turchin's and another brigade were sent to capture Brown's Ferry below Chattanooga and did the work completely. Then came the storming of Missionary Ridge, in which Mr. Adney and his brother Robert took part and went on with the army, following the rebels to Ringgold. The Thirty-Sixth Ohio Regiment, upon the request of General Crook, who wished his old regiment with him, was then ordered into the Shenandoah Valley and took up the work against General Early's troops. There General Crook met too strong opposition to make progress, and was driven across the Potomac River, where he awaited General Sheridan with reinforcements. The battle of Winchester, noted in American literature by the pen of one of our poets, was fought, but Mr. Adney had been wounded before that and was in a hospital. He was shot through the mouth, the ball coming out just under the jaw bone. The army surgeon pronounced it a fatal wound. However, he recovered, was placed in the invalid corps, but the humiliation of being slighted as an invalid told on his nerves and he asked to be sent to his regiment. His request was granted and he continued service in the valley until the end of the war. Another incident of his service in Virginia was his participation in a raid on Lynchburg, then occupied by a small Confederate force. The raiding detachment was commanded by General Hunter, and the plan was that he should capture the city and then march out through the Shenandoah Valley to safety. After the journey across the mountains brought the little army up to Lynchburg, Hunter feared the place was too strong, though as a matter of fact it was weakly garrisoned, and he delayed from day to day his attack until the rebels had brought up reinforcements and were not only prepared to defend but for an offensive against Hunter. The general then ordered his men to fall back, and over the same mountain region which they had recently traversed retired toward Kanawha through a hostile country and without provisions other than those foraged from an almost destitute people. On this retreat Mr. Adney was without food for three days except one piece of pork little larger than an oyster, and the black coffee which was always the bosom companion of the Federal soldier. This experience disgusted the entire command with General Hunter as a leader, and their dislike grew into almost hostility before they reached safety and food and were relieved of his presence. Mr. Adney was promoted from sergeant to first lieutenant while in the Shenandoah Valley, and was at Winchester when the war ended. He was mustered out at Columbus, Ohio, August 12, 1865, having served over four years. After coming to Kansas he joined the Grand Army Post at Kendall, and is now a member of the Syracuse Post. About two years after stepping out of the army into the ranks of a civilian Mr. Adney married in Gallia County, in September, 1867, Miss Elizabeth Blazer. She was a daughter of Henry and Rebecca (Jackson) Blazer, her father a native of Ohio, of Pennsylvania Dutch stock, and a farmer by occupation. Mrs. Adney was educated in an academy at Ewington and early took up educational work and followed it until her marriage. 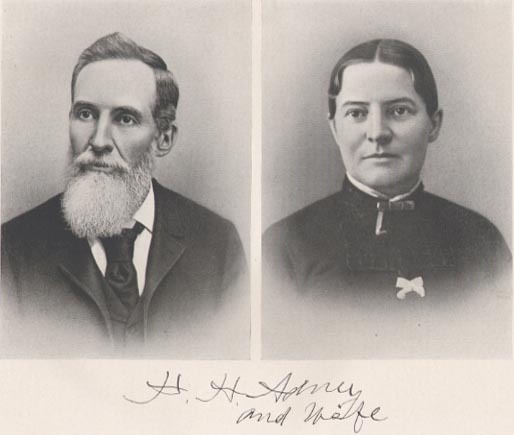 Soon after his marriage Mr. Adney moved west to Holt County, Missouri, and was actively engaged in farming there until his advent to Western Kansas. In 1880 he made a trip across Kansas into Colorado and on the way took observations as to those portions of Western Kansas which were open and best fitted to the stock business. At La Junta, Colorado, he bought a bunch of sheep from the Jones Brothers, ranchmen, and drove them back into Hamilton County. He continued in the sheep industry for sixteen years, abandoning it when a low tariff or free trade congress so legislated as to make the wool industry unprofitable. Giving up sheep he entered the cattle business. Besides his homestead Mr. Adney also took a preemption, and both the claims now belong to the Adney estate of 300 acres. He early became identified with local affairs. He was one of the early members enlisted in this country in the Anti-Horse Thief Association, an organization that served a splendid purpose in protecting the livestock of the pioneers here as in other states of the West. For many years Mr. Adney was a Methodist, but is now connected with the Apostolic denomination. Politically a republican, he cast his maiden vote for Abraham Lincoln in 1864 and went home from the army hospital in order to cast this ballot.